Owners of big screen monitor and LCD screens might have been to fully experience the visual magnificence of high definition movies and videos however when it comes to browsing the internet, users will be stuck with the same web browsers offered to other computer users who use normal-sized screens. Recently a company called Hillcrest Labs created a device called The Loop which is a type of motion detecting remote control supposed to help big screen owners browse their computers. Realizing that the device needed an extra push, Hillcrest Labs developed what I am writing about today: Kylo. 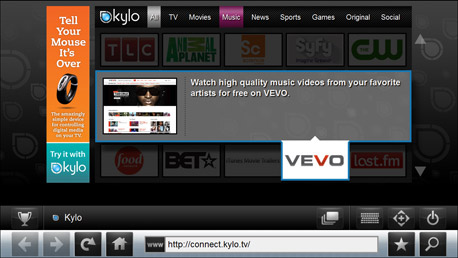 Kylo is a free internet browser developed by Hillcrest Labs. The browser was created in order to facilitate online browsing from a distance to big screen monitors. Amongst other features, the browser offers lots of viewing space and no visual clutter, big fonts and big buttons for easy navigation from across the room, an easy-to-use onscreen keyboard, and zoom-and-pan power that brings every site into view. 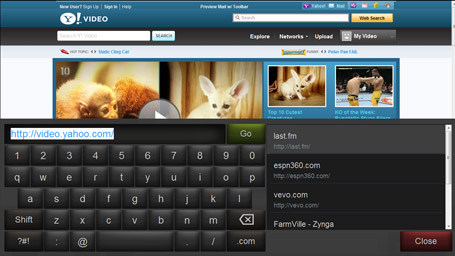 The onscreen qwerty keyboard helps users take full advantage of their Loop as it eliminates the need for a keyboard by the user’s side. Wireless mouse owners will also be able to benefit from this feature. The browser also has the main bar and address bar located at the bottom of the page instead of the top. 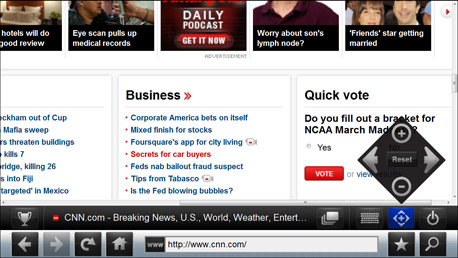 When it comes to big screens looking at the bottom of the page is friendlier to the eyes than looking at the top. If a particular area on the webpage feels to be too small, users can simply use the zoom-and-pan feature. This ensures that browser can be fully taken advantage of by sitting on the couch. In conclusion, Kylo is a web browser which all big screen owners should give a try.